Gerry Conlon began his musical career in Irish traditional music in his second year at Saint Roch’s secondary school in Glasgow, where he became a founder member of the school ceilidh Band. Under the guidance of the legendary Frank McArdle (principle teacher of Mathematics) he started playing the piano accordion and very quickly progressed from novice to champion. During his traditional career, Gerry won 12 Great Britain titles and 4 All-Ireland titles on both piano accordion and piano. 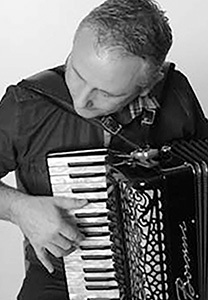 He also competed in the traditional Scottish music scene and won the All Britain Scottish Piano Accordion Championships in 1982. Gerry has frequently played at every major event in the competitive Irish Dance calendar over the past 30+years. He is well respected in Australia, New Zealand, America, Canada, USSR, Europe, Ireland and every corner of the UK and has composed many of the popular tunes sought after on today’s Irish Dance circuit. In recent years Gerry was musical Consultant to the film ‘Jig-the movie’ and composed much of the incidental music used in the film. He also played a similar role in the making of ‘Irish Dancing Tweens’ (a TLC Productions series for Sirens Media), part of which was filmed at the World Championships in Belfast 2012.